I have a problem. It’s a doozy. I have an addiction to cheap video games. But not games like those in the Steam sales. Oh no, I like cheap console games. You see, I don’t have a gaming PC (I had to use my work laptop to play Gone Home) so I do almost all of my gaming the old fashioned way. So, you would think I would be shelling out a pretty penny to play games and develop a backlog. You see, I rarely, if ever, buy games the day or week they come out. There are exceptions to this, of course, like Bayonetta, Mario Kart, or the upcoming Persona Q. I tell myself that I don’t buy those because their prices won’t drop right away, and I’m usually right. But for other games, if I wait about three months (maybe less), the price will likely be down to 20 bucks or even less than that. And now, with the Xbone and PS4 out, the price of games for the previous generations are even cheaper. I have quite a large video game collection. 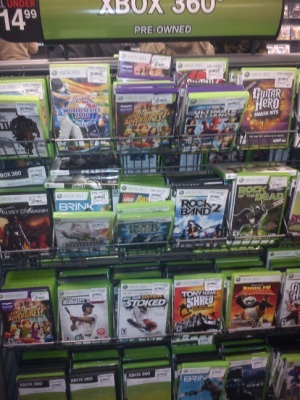 Very few of the games in it were bought at full price. And I don’t have time for most of them. As I said on here before, I have a killer commute. Two hours, one way. It’s on the train, so I can play some portable games (as long as I don’t get motion sick doing it), but most of gaming occurs on Sundays when I tell my friends I’m busy and for about an hour before bed. Since I have a fondness for JRPGs, it’s unlikely that I will complete a game in a week. As you can imagine, this leads to quite the backlog. Yet, I keep buying more games. Over the weekend, for example, I went to a used games’ store/comic book shop with my little brother. This place has quite a few retro games, and I’m trying to rebuild my Genesis game collection (I sold it like a moron when I was younger and emulation just isn’t the same). I browsed the shelves, and found a couple games from my childhood including Tiny Toons: Buster’s Hidden Treasure (not a good game) and World of Illusion Starring Mickey Mouse and Donald Duck (a very good, creepy game). Those games were like 5 bucks each, so no problem. I also found a copy of Phantasy Star III, which I believe is a good game, and cost me 15 bucks. While browsing the PS2 section, I saw a copy of Rogue Galaxy, which is a JRPG that I heard of but never played. It was factory sealed, complete, and only 25 bucks. Done, done, done. You see, it was also Tax-Free weekend here in Massachusetts, so I didn’t need to pay sales tax. The store also was running a discount of an extra 6% on everything. So, all told, I got about 4 games for roughly 50 bucks. Pictured: Me if I wasn’t a human. I spent the weekend playing World of Illusion with my little brother, and feeling super nostalgic about it. I’ve never beaten Tiny Toons so maybe one of these days I will. I love old school JRPGs, but I don’t know if I’ll ever around to playing Phantasy Star. Rogue Galaxy sounds really interesting and right up my alley, but maybe I want to play Kirby: Triple Deluxe first. It’s kind of ironic how, now that I’m an adult and can afford to buy all these games, I don’t have time to play them. I buy them, often aware that I probably won’t play them right now, or even ever, but I still buy them regardless. Am I alone with this first-world problem? Or do other people have a similar addiction?